1. Protective Relay : It is an electrical relay, which closes its contacts when an actuating quantity reaches a certain preset value. Due to closing of contacts, relay initiates a trip circuit of circuit breaker or an alarm circuit. 2. Relay Time : It is the time between the instant of fault occurrence and the instant of closure of relay contacts. 3. Breaker Time : It is the time between the instant at circuit breaker operates and opens the contacts, to the instant of extinguishing the arc completely. 4. Fault Clearing Time : The total time required between the instant of fault and the instant of final arc interruption in the circuit breaker is fault clearing time. It is sum of the relay time and circuit breaker time. 5. Pickup : A relay is said to be picked up when it moves from the 'OFF' position to 'ON' position. Thus when relay operates it is said that relay has picked up. 6. Pickup Value : It is the minimum value of an actuating quantity at which relay starts operating. In most of the relays actuating quantity is current in the relay coil and pickup value of current is indicated along with the realy. 7. Dropout or Reset : A relay is said to be dropout or reset when it comes back to original position i.e. when relay contacts open from its closed position. The value of an actuating quantity current or voltage below which the relay resets is called reset value of that relay. 8. Time Delay : The time taken by relay to operate after it has sensed the fault is called time delay of relay. Some relays are instantaneous while in some relays intentionally a time delay is provided. 9. Sealing Relays or Holding Relays : The relay contacts are designed for light weight and hence they are therefore very delicate. When the protective relay closes its contacts, it is relieved from other duties such as time lag, tripping etc. These duties are performed by auxiliary relays which are also called sealing relays or holding relays. 10. Current Setting : The pick up value of current can be adjusted to the required level in the relays which is called current setting of that relay. It is achieved by use of tappings on the relay coil, which are brought out to a plug bridge as shown in the Fig. 1. The tap values are expressed in terms of percentage full load rating of current transformer (C.T.) with which relay is associated. 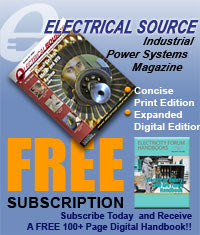 Pickup current = % current setting x rated secondary current of C.T. So if C.T. is 500 / 10 A i.e. 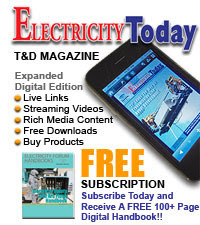 rated secondary current is 10A and the current setting is 150 then pickup current is 1.5 x 10 = 15 A i.e. 150% of 10. So when relay coil current is greater than or equal to pickup values, relay operates. 12. Time/P.S.M. Curve : For a relay, a curve showing relation between time and plug-setting multiplier is provided which is called time/P.S.M. curve. A typical curve for a relay is shown in the Fig. 2. It can be observed that for low values of overcurrents the operating time varies inversely with the current. But as the current increases and approaches upto 20 times its rated value then then the tome becomes almost constant. This type of characteristics is necessary to ensure discrimination on very high fault currents flowing through healthy part of the system. Using this curve and time-setting multiplier, the actual time of operation of a relay can be obtained. 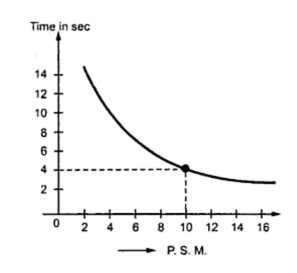 For example, the time in seconds corresponding to P.S.M. of 10 is 4 seconds as shown in the Fig. 2. Multiplying this by a time-setting multiplier, actual time of operation can be obtained. 13. Time-setting Multiplier : Similar to current setting, a relay is provided with a feature with which its time of operation can be controlled. This feature is known as time-setting multiplier. 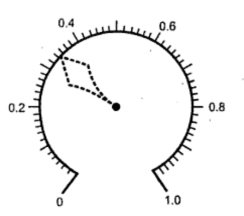 Its dial is calibrated from 0 to 1 in steps of 0.05 as shown in the Fig. 3. 14. Trip Circuit : The opening operation of circuit breaker is controlled by a circuit which consists of trip coil, relay contacts, auxiliary switch, battery supply etc. which is called trip circuit. 15. Earth Fault : The fault involving earth is called earth fault. The examples of earth fault are single line to ground fault, double line to ground fault etc. 16. Phase Fault : The fault which does not involve earth is called phase fault. The example is line to line fault. 17. Protective Scheme : The combination of various protective systems covering a particular protective zone for a particular equipment is called protective scheme. For example a generator may be provided with protective system like overcurrent, differential, earth fault etc. The combination of all these systems is called generator protective scheme. 18. Protective System : The combination of circuit breakers, trip circuits, C.T. and other protective relaying equipments is called protective system. 19. Unit Protection : A protective system in which the protection zone is clearly defined by the C.T. boundaries is called unit protection. Such systems work for internal faults only. 20. Reach : The limiting distance in which protective system responds to the faults is called reach of the protective system. The operation beyond the set distance is called over-reach while failure of distance relay within set distance is called under-reach.